The story of female secret agent Jos Gemmeke is the ‘centre piece’ of this exhibition. 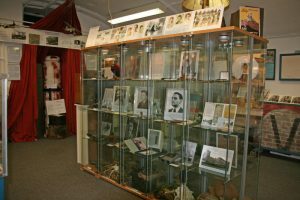 She died 20th December 2010 leaving the CRASH Air War and Resistance Museum ’40-’45 a very important legacy of personal objects regarding her work as a resistance worker, secret agent, paratrooper and member of First Aid Nursing Yeomanry (FANY). In this legacy however there was also an immense collection of documents, photo’s and artifacts about Dutch Secret Service agencies during WWII. These documents were collected by the Dutch author and reporter of the Dutch Foundation ’40-’45 Eddy de Roever, who wrote four books about this subject. Not only did De Roever collect documents, he also had a collection of personal belongings of the secret agents which was handed over to Jos Gemmeke some years ago. These documents and artifacts are the backbone of this exhibition which places the resistance workers and their courageous work in the lime light once again. Special Operations Executive (SOE), the secret British organization was founded July 19th 1940 by Winston Churchill. His motto: ‘Set Europa ablaze’. After Hitler had occupied the mainland of Europe and the Battle of Britain had begun, Churchill came up with this plan. Specially trained people had to execute terrorist actions in occupied countries and agents were to be trained to form a network of resistance. These special services had an independent status next to the Military Intelligence Service because the work they had to do, could not be trusted to officers with a conventional training. It needed volunteers with enough courage and strong nerves to undertake the most dangerous actions. They came by the hundreds: Dutchmen, Scandinavians, Belgians and Frenchmen. They formed a secret army in which subversive actions and sabotage operation against the Germans were centralized. There was also a Dutch section: SOE Dutch. In Holland it became a disaster. Because of treason and failure the whole network was infiltrated by the Germans between 1942 and 1944. This so called Englandspiel took the lives of 54 agents and hundreds of resistance workers. After the infiltration was discovered the Bureau for Special Assignments (BBO) was founded and this was able to drop agents with more success from 1944 till the end of the war. The responsible bureau in London, the MVT was disbanded after the Englandspiel disaster. Holland was in need of a new network of secret agents. March 15th 1944 a new organization was founded next to the Dutch Intelligence Bureau (BI): the Bureau for Special Assignments (BBO). It’s task was to create a new secret army of resistance by training people and coordinating actions. Agents were dropped in Holland to establish contact between the resistance groups and London. The B.I. trained agents to become radio operators and transmit messages to London. They were dropped in Holland with their equipment and had to maintain communication between the resistance units and the Dutch government in London. BBO was assigned to sabotage actions: destroy railways but also eliminating Germans. BBO had to report to SOE. Between March 31st 1944 and April 23rd 1945 almost 70 agents were dropped as well as five so called Jedburgh-teams. BBO organized 211 dropping of agents, weapons and other equipment at 86 different fields. In this period 17 agents were killed.